Just last year, when he was a federal circuit court judge in Denver, the Supreme Court’s new justice, Neil Gorsuch, did something judges rarely do. Gorsuch wrote the main opinion, explaining why he and two other judges on the 10th Circuit Court of Appeals ruled against the Obama administration in Gutierrez-Brizuela v. Lynch, an immigration case. But then he added an even longer analysis — just from himself — sharply criticizing a judicial precedent that federal agencies and environmental groups have relied on for decades to protect people, public lands and rare species. Known as the Chevron doctrine, it stems from a 1984 Supreme Court ruling. 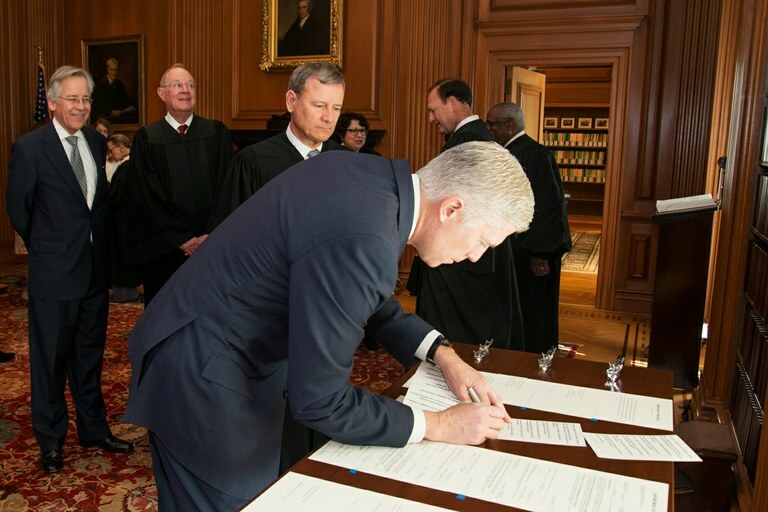 Chief Justice John Roberts Jr. and fellow justices watch as Neil Gorsuch signs the Constitutional Oath on April 10. And because of Gorsuch’s Western roots, Cheever says, other justices may follow his lead on regional issues as they followed former Western members of the court, such as Justice Sandra Day O’Connor. While the Denver-born Gorsuch, who served on the 10th Circuit since 2006, may have more insight into conflicts over public lands than most Eastern judges, other experts scoff at Gorsuch’s Western credentials. Gorsuch has spent much of his life in Washington, D.C., moving there as a teenager in the early 1980s, when his mother, Anne Gorsuch Burford, headed President Ronald Reagan’s Environmental Protection Agency. He attended high school, college and law school on the East Coast and spent his early legal career in the nation’s capital. Gorsuch joins the Supreme Court at a time when there is growing criticism of Chevron. Though the majority of the court relied on Chevron and deferred to the Federal Communications Commission in the 2013 case City of Arlington v. FCC, Chief Justice John Roberts wrote a strongly worded dissent, warning of “the danger posed by the growing power of the administrative state.” In a 2015 case upholding the Affordable Care Act, Roberts expressly stated that the court wasn’t deferring to the agency under Chevron, as a lower court had, but instead was resolving the ambiguity in the statute itself. Meanwhile, congressional Republicans are trying to get rid of it altogether. The House passed a law in January that would instruct courts not to defer to agencies’ interpretations of ambiguous laws. The Senate has yet to act. Environmental groups likely would cite Chevron in defending the Obama administration’s environmental rules, including the EPA’s Clean Water and Clean Power Plants rules and the BLM’s methane and hydraulic fracturing rules. But those cases may not make it to the Supreme Court; President Donald Trump already is trying to rollback many of these regulations. Chapman University, in Orange, California. Gorsuch is only 49 and could be on the court for decades. How might his presence there determine what happens when future administrations try to expand protections for the West’s public lands and environment? That answer depends on unpredictable factors, including whether Trump has by then appointed additional justices who share Gorsuch’s antipathy for Chevron. What is clear is that Gorsuch will be pushing the court to reassert its role in interpreting statues — and will block agencies that try to regulate based on their own interpretations. Another version of this story was published in our print magazine on May 1, 2017.